This is a very fun post for me. :) I have a ton of recipe print outs, bookmarks, cookbooks and magazines. The other day I picked a few different pies and cakes and asked my daughter to pick which one I should make. 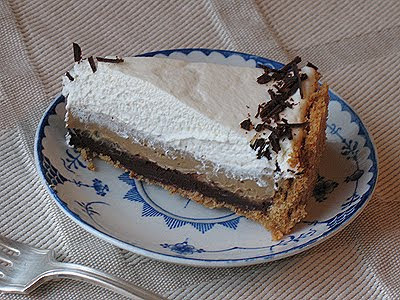 She chose a recipe from an old Taste of Home magazine called Cappuccino Chocolate Pie. Well, that particular recipe used chocolate chips, corn syrup, a packaged graham cracker crust, Cool Whip and two boxes in vanilla pudding. 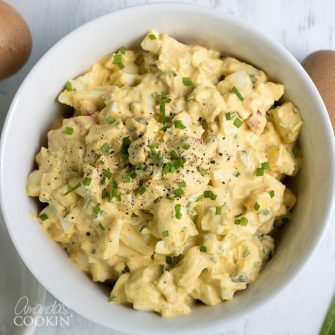 While I’m sure it would have been tasty, I opted to revamp this recipe and make it my own by using more ingredients from scratch. I’m branching out more and more now, making recipes my own, and like with my Chocolate Dappled Pumpkin Cake, I changed the original recipe so much that this pie is a whole new recipe of its own now. My first challenge was to find something that could replace the boxed pudding. I found several different vanilla pudding mix recipes, but none of them were “instant”. So I had to change the list of ingredients to compensate for that. 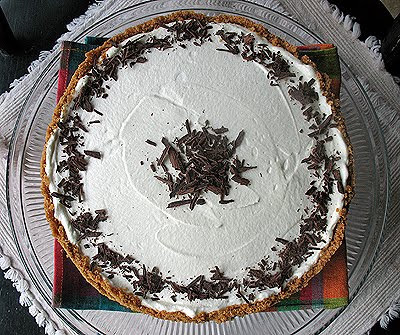 The remaining substitutions were fairly easy… semi sweet chocolate instead of chocolate chips, butter in place of corn syrup, whipping cream instead of Cool Whip, and a homemade crust instead of a ready made one. NOTE: In this recipe I refer to “homemade pudding mix”, which I list below. I have also done the math so that you don’t have to make an entire batch of pudding mix like I did, you can use the measurements for one serving. I have not tried this pie using the smaller measurements, but I can’t imagine there would be any problem with it. This pie is good (if I do say so myself). It passed the “daughter test” with flying colors. She loved it, a big thumbs up. :) I highly recommend keeping this pie refrigerated, but bringing it out about an hour before serving to make it easier to slice as the chocolate layer gets rather firm in the fridge. NOTE 2: I noticed that my crust crumbled a little, but that was when I tried to cut the pie when it was still cold. So be sure to wait until the pie has been sitting at room temp for a while before trying to slice. 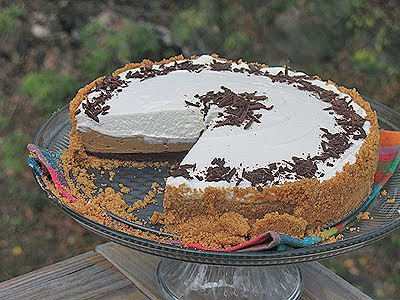 * to replace the 1 cup of pudding mix in the pie recipe, combine 6 tablespoons of dry milk powder, 1/2 cup of granulated sugar, 1/8 teaspoon salt, and 6 tablespoons of cornstarch. Run through a food processor. ** instant coffee comes in crystals. Place the crystals in a sandwich bag, squeeze the air out and seal it, and roll the jar over the bag grinding them up. You can also grind it with a mortar and pestle. One tablespoon of crystals will yield about half of a tablespoon of ground instant coffee. 1 teaspoon clear vanilla regular will work! Stir together the graham cracker crumbs, sugar and salt. Add the graham cracker mixture to the melted butter, using your fingers to combine until evenly moistened. Pat crumb mixture into bottom of springform pan and an halfway up the sides. Place pan on a cookie sheet and bake in preheated oven for 10 minutes. Set crust aside to cool while you make the pie filling. Place chopped chocolate and butter in a double boiler, or in a glass or metal bowl over simmering water, and stir occasionally as it begins to melt. Once chocolate is almost melted, slowly add the cream and vanilla. Stir over heat until smooth and completely melted. Poor ganache into the crust and spread evenly. Set aside. Stir the clear vanilla into the whipping cream. Sift the powdered sugar over the whipping cream mixture and, using the whisk attachment, beat on medium high until stiff peaks form. Reserve 1 1/2 cups for the filling and refrigerate the rest until needed. Beat cream cheese in mixer with paddle attachment until smooth. Gradually add the milk and brewed coffee, scraping down sides of bowl occasionally. Turn off mixer and use whisk to combine smaller pieces of cream cheese with the milk. Whisk together the pudding mix and ground instant coffee then whisk into the milk mixture. Whisk in 1 1/2 cups of the whipped cream into the milk mixture. Pour filling mixture into a medium saucepan. Turn flame on medium low and slowly add the whipped egg, whisking in as you cook. Mixture will thicken quickly, so whisk continuously until you have a very thick custard. Do not allow mixture to stick to the bottom of the pan. Remove from heat. Whisk the pudding in the pan, then run it through strainer into a bowl. Place a layer of plastic wrap directly onto the pudding so that a skin does not form. Refrigerate the pudding for about half an hour to cool. 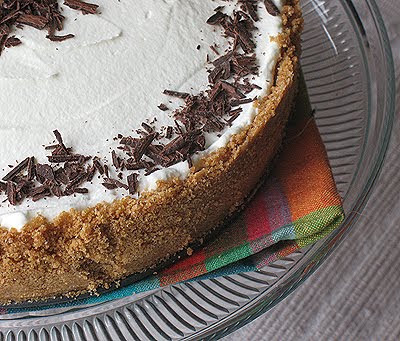 When cool, whisk again to make pudding smooth and pour into pie shell on top of ganache. Top with whipped cream. 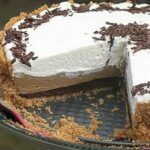 Refrigerate pie for at least 4 hours (overnight is best) to allow filling to set. To serve, remove pie from the refrigerate about an hour before serving to make it easier to slice. Combine milk, sugar, salt and cornstarch in a food processor and process until uniform. You may need to do this in 2-3 batches. Store mix in airtight canister or a closely covered jar. To use: Stir the mix in the canister before measuring out 1/2 cup mix into a pan. Add 2 cups milk AND 1 teaspoon of vanilla and cook over low heat, stirring until mixture thickens and comes to a boil. Continue stirring for 1 minute, remove from heat and pour into individual serving dishes. Pudding will thicken further as it cools. Amanda you always have great ideas both delicious and eye-catching! You are my fave to follow. Okay who ever makes it first call me. I'll be right over …. What could be better than a pie filled with espresso & chocolate. Love this Amanda! Your daughter must have been thrilled with this version of the pie. Gorgeous! Wow, this pie looks amazing! Thank you for the homemade pudding mix recipe. I will be using that all the time, especially since I have a big box of non-fat powdered milk in my kitchen. Lovely photos. Oh. My. Goodness. OUTSTANDING job, Amanda! Your own recipe–how fabulous! The pie is stunning and I'm sure its so delicious. 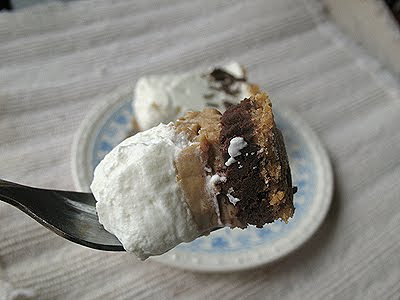 I cannot WAIT to make this one. Will report back. Bravo!! This looks fantastic. A lot of work, but looks worth it. 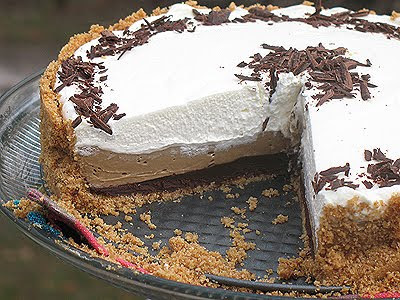 I love how defined all the layers in your pie look!